In Massachusetts, students and supporters crowded in front of the state house. I watched as more and more young people, ranging from elementary school to college, joined the chanting crowd. School buses arrived filled with students who brought signs and posters. In 2018, a UN climate report warned that we only have about 12 years until irreversible and detrimental climate damage. With an unresponsive federal government, young people have taken it upon themselves to demand action. Clean Water Action is working to address climate change in Massachusetts through campaigns focused on energy policy reform, carbon pricing, and programs to prepare future leaders in environmental advocacy. Climate changes, and the factors that contribute to them, have extreme and negative impacts on human health and well-being all over the world. Pollution from fossil fuel has caused an increase in asthma rates, extreme weather produces super-sized storms that tear apart homes and communities, and warming temperatures and rising sea levels threaten the livelihood of millions. In fighting climate change, young people have proven to be a crucial voice. In fact, Greta Thunberg, a 16-year-old climate activist from Sweden, has recently been nominated for the Nobel Peace Prize. As young people, we know that the passage of sweeping climate legislation is not only necessary, it's the only way to stop the devastating effects of climate change. 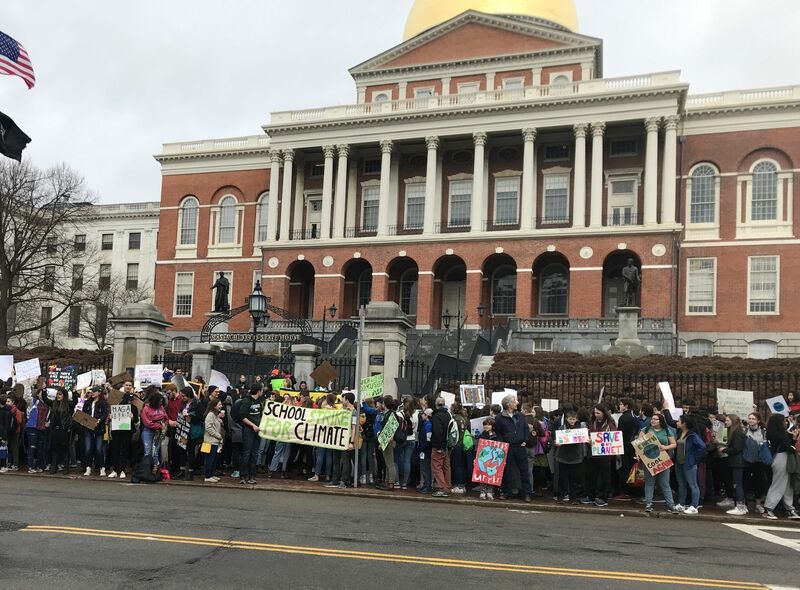 At Youth Climate Strike in Boston, I saw several signs that read “Pass the New Green Deal,” referring to a resolutions proposed by New York Rep. Alexandria Ocasio-Cortez and Massachusetts Senator Ed Markey. The New Green Deal would set in place goals for transitioning away from fossil fuels, protect low-income communities and communities of color from disinvestment, and create green jobs with proper training and benefits. Many people have called the proposal too ambitious or not attainable, but I believe that these types of goals are just what we need. And, with this new generation of climate activists, comes a deeper understanding of the importance of intersectionality. Young people have an unprecedented knowledge of how climate change and other social issues impact communities of color and low-income communities more profoundly- just look at the student activists from Parkland. Other signs at the rally read, “What gives you the right to burn our future?” and “If you won’t be adults we will.” I thought that these signs exemplified exactly why this movement is so important. When current leaders not only refuse to take necessary action, but continue practices that are destroying the earth, its young people who are forced to face the consequences. Addressing climate change can sometimes feel like a hopeless and daunting issue. It’s easy to wonder if we will ever make progress. Some adults may call us naive or say we can’t possibly know what we’re talking about. But, after attending the Youth Climate Strike, I felt proud of my generation. The determination, organizing, and passion of my fellow students was inspiring. The Youth Climate Strike showed that when young people come together, there’s nothing we can’t accomplish.